MAGICK RIVER: Passing Wind & The Paranormal Music Society ~ featuring Linsey Pollak @ Professor Squealy Deetbum! Passing Wind & The Paranormal Music Society ~ featuring Linsey Pollak @ Professor Squealy Deetbum! One of the most amazing artists I had the privilege of bumping into in 1991 on my first visit to Australia (sponsored by the Department of Cultural Affairs) was a muso named Linsey Pollak, who happened to be creating some music for Doppio Teatro (a trilingual touring theatre company founded by Teresa Crea) . I knew he was amazing within minutes of our meeting. How so? I showed him my Balinese flutes and he tried one out and instantly was able to coax the sweetest sounds out of it. At the time I didn't know Linsey could coax sweet sounds out of garden hoses and broomsticks. Linsey gave me a cassette his group - the Paranormal Music Society - had recently released, which featured Linsey playing, among other odd instruments, the kitchen sink and a rubber glove gaida (a miniature bagpipe made from a surgical glove - that's right, another Pollak invention). Twenty-one years later, I chance upon Linsey Pollak yet again - this time on YouTube. Actually, I was looking for some inspiring music to feature on this blog and did a search for the Paranormals. The original band seems to have disappeared - but Linsey Pollak is just as amazing and musically alive as ever, perhaps even more so. Indeed, I regard this unassuming genius as one of the most masterful musicians I have ever been inspired by. Linsey Pollak certainly gives Didier Malherbe (wind instrumentalist with Gong) and Jan Garbarek a jolly good run for their money... and he's a damn lot funnier! The Paranormal Music Society consisted of: Professor Crivici (Romano Crivici) on keys and violin; Frank Brutal (Blair Greenberg) on percussion and guitar; and Denis Bland (Linsey Pollak) on winds (of many persuasions). The Paranormals (as they were fondly called) had a cult following in Sydney and were known for channeling the works of dead composers (especially Hidegarde Spumoni, a lesser known Baroque composer) and playing music whose notes were determined by rolls of a giant dice. They improvised requests called out by the audience. Things like: the pinnacle guinea pig races, haddock, Bob Marley goes to Turkey, Rawhide and so on. They recorded two albums (but only released one, Moving On), They were a legend in their own time. Devised by Linsey, Out of the Frying Pan was commissioned by The Out of The Box Festival in Brisbane, directed by Chris Willems and produced by Performing Lines. It created music from house and garden objects with a cast of musician/actors that included Ceri McCoy, Jorge Rico, Penny Glass, Kari and Linsey. It was a show for 3-8 year olds that created music from bottles, glasses, brooms, mops, chairs, a ladder, rubbish bins, a garden fork, an ironing board, a carrot, inflatable trousers, a hammer, a kettle, a pumpkin, etc, etc. Ivan is a home-styled kitchen-hand with a difference. He's eccentric, hilarious and totally irresistible. And he lives in a musical world where anything is possible. From the moment Ivan walks into the kitchen, everything becomes musical: carrots, potatoes, satay sticks, meat cleavers, and even an electric drill, with which he transforms a carrot into a clarinet before our very eyes. This musical world that Ivan creates is more than a series of clever tricks. It is an aural world of depth, energy and beauty. Although the materials are disconcertingly simple, the music itself is complex, rich and emotive, ranging from energetic and percussive cross-rhythms to haunting and lyrical woodwind (or should we say vegiewind) melodies. As with his previous solo show, Knocking on Kevin's Door, Linsey uses digital technology to record sounds instantaneously so that the audience is able to see each piece being constructed layer by layer, but in this show all the sounds come from the cooking utensils and the food. The Art of Food is an aural feast, an ode to the music of everyday life, which is there for everyone who cares to open their ears. Linsey live loops voice percussion and melodica, soloing with Rubber Glove bagpipe, Chinese bamboo flute, and kaossilator. From his solo show, Live & Loopy. Linsey loops balloon, kaossilator and vocals, using TC Helicon VoiceLive Touch. This piece called "Ghosting 13" (in 13/8) is from Linsey's solo show, Live & Loopy. It features the saxillo and carrot clarinet. Linsey live loops vocal percussion, bubble wrap drum, melodica and kaossilator, with solos on saxillo (a wooden soprano sax-like instrument designed and made by Linsey) plus a carrot clarinet. Linsey Pollak drills out a carrot and turns it into a clarinet and plays it, live looping with a Boss RC20 to record 3 layers. From his solo show, Making Jam. The mouthpiece is connected to the carrot with a 12mm OD tube 35mm long. (Use electrical tape to increase diameter to suit mouthpiece). Bottom of mouthpiece is at top of carrot. This design is by Linsey Pollak and has been developed since 1995. Linsey Pollak plays "Mr Curly" (a contra bass clarinet made from garden hose) - from his show, Passing Wind, as well as the feather duster clarinet. 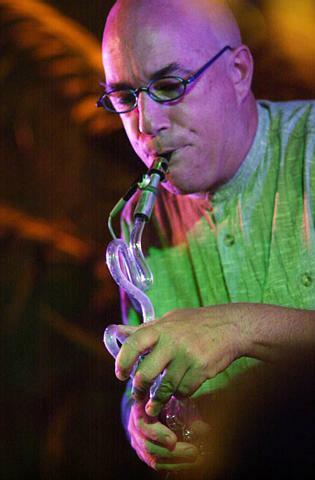 Linsey Pollak live loops watering can clarinet - from his solo show, Live & Loopy. Professor Squealy Deetbum (aka Linsey Pollak) plays the Harmonic Handlebar from his solo show CYCOLOGY. Professor Squealy Deetbum (aka Linsey Pollak) plays the bicycle and accessories in the Finale from his solo show, CYCOLOGY. Two condoms are used (one inside the other) to create the bag for this bagpipe. The chanter and drone are aluminium tubes with a membrane reed at the top of each. Very interesting and informative blog. I have just invented a new instrument called the Saxinet which I thought you and your readers might be interested in. The Saxinet combines elements of chalumeau, clarinet, recorder and saxophone. The Saxinet is only 13.5" or 15" long, so sou can take the Saxinet anywhere. I believe that it could also become an important tool in music education. Please have a look at my website or go directly to www.Saxinet.com . I'd be very happy to discuss this further with you or answer any questions you might have. "A Look to the Heavens"